Narendra Modi Sunday launched a scathing attack on Andhra Pradesh Chief Minister and TDP supremo Chandrababu Naidu, saying he has made a "U-turn" on promises of development by not using central funds in an appropriate way and failing to develop the state. "Our government gave to Andhra Pradesh much more than what was mentioned in special status. CM of Andhra Pradesh acknowledged this package but took a U-turn as they failed to use the funds in the appropriate way and were not able to develop the state," Modi said, addressing a public rally.Modi lashed out at Naidu for aligning with the Congress, saying the former chief minister N T Rama Rao (NTR) had launched the party to make Andhra Pradesh "congress-mukt" after he was a victim of its 'arrogance. 'The Prime Minister said Naidu had been saying he was his senior and he had no problems with it. "He keeps reminding me he is senior. There is no debate in this. I have never shown any disrespect to you since you are a senior.Babu garu is senior in jumping parties, senior in switching to new alliances and in backstabbing own father-in-law (NTR).He is a senior in losing every other election. He is a senior in sitting in the lap of the same person whom he criticises. He is senior in destroying the dreams of (people of) AP. I am certainly not a senior in that respect," Modi said, amid peals of laughter.Modi, who was on his first visit to the state after the TDP walked out of the NDA government at the Centre in March last year, came down heavily on Naidu, whom he repeatedly referred to as "father of N Lokesh." Modi alleged Naidu was taking him on since the Centre had sought details of every paise given to Andhra Pradesh. Naidu had promised walking in the footsteps of NTR,Modi said and asked if the Chief Minister had lived by it. creator!Hes obviously creating lots of wealth for him and his son while AP suffers. "The Chief Minister promised the redevelopment of Amaravati but is now engaged in his own development, the Prime Minister alleged. He said Naidu had not initiated any new programmes for the poor but was only putting his stamp on the NDA government's development schemes.On providing clean fuel in the country, Modi said while in 60 years, only 12 crore gas connections were given, the NDA government had given 13 crore gas connections in just four years.Earlier, the Prime Minister dedicated two major petroleum and gas projects--a strategic petroleum reserve facility at Visakhapatnam and a gas field at Amalapuram worth Rs 6,825 crore to the nation through remote control system. Modi said his government was working towards ensuring energy security for the country while simultaneously building a clean fuel economy.He also laid the foundation-stone for the construction of a Rs 2,280 crore coastal terminal of Bharat Petroleum Corporation Limited at Krishnapatnam in SPS Nellore district. 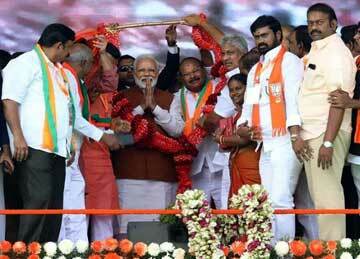 During the rally, Modi said "Our aim is to have a new India that is clean and pollution-free. Such projects are the key to the nations energy security," Modi said. The Centre was building oil reserves at various locations across the country to ensure there was no shortage of oil and gas in times of crises, he said, referring to a similar facility he inaugurated in the north-east on Saturday. "Our government has been working continuously to make India a clean fuel economy and several projects have been initiated in this direction," he added. Referring to the strategic petroleum reserve facility of Indian Strategic Petroleum Reserve Limited (ISPRL) at Visakhapatnam and the ONGCs Vasishta S1 gas field in the Krishna-Godavari Basin at Amalapuram, the Prime Minister said they would not only help create jobs but also aid in the development of gas-based industries in the region.Earlier, when Modi arrived at Gannavaram airport in Vijayawada, TDP workers staged protests.The Chandrababu Naidu-led party quit the BJP-led NDA protesting the "injustice" done to the state post-bifurcation. Giving the protocol a go-by, none of the state ministers turned up at the airport to formally receive the Prime Minister. BJP leaders alleged that people were "thwarted," from reaching the venue in large numbers and said countdown would start for Naidu with Modi's rally at Guntur.Commenting on the black balloon protests against him by TDP workers, Modi quipped he welcomed it recalling the tradition of smearing black to ward off evil designs. Modi said: "In the last four and a half years, whatever had to be done to ensure justice for my sisters and brothers of Andhra Pradesh, we have done. We stand with Andra Pradesh and its great people."